Wise parents who celebrate Christmas advise their young children not to make unreasonably grandiose requests of Santa. After all, he has to squeeze down a rather narrow chimney to deliver their presents. But as Christmas approaches this year, leaders of Congress, the Pentagon, and the Trump White House seem to have forgotten that lesson. Their wish list for the U.S. military, if taken seriously, will bust the federal budget at the very time Republicans are ramming through tax legislation that will shrink Uncle Sam’s savings account by more than a trillion dollars over the next decade. In addition to lavish spending on new weapons — like $10 billion for purchases of the disastrous F-35 Joint Strike Fighter — this Christmas legislation for the military includes all sorts of smaller presents, including billions of dollars to fund NATO’s European Deterrence Initiative (whatever happened to Trump’s demand that our allies pay for their own defense? ), missile defense systems of doubtful efficacy, and development of a new cruise missile that would violate the 1987 Intermediate-Range Nuclear Forces treaty with Russia. Under the arcane rules of Congress, the House and Senate must still translate this blueprint into actual budget appropriations. Therein lies the rub. Back in the days when Republicans still claimed to believe in balanced budgets, they led the way in enacting limits on federal spending. Current law caps core defense spending at $549 billion in fiscal year 2018. The defense authorization bill, in contrast, pegs the request for core Pentagon operations at $634 billion, with another $66 billion to fight ongoing wars in Afghanistan, Iraq, Syria and other hot spots. The latter funds are not subject to budget caps. 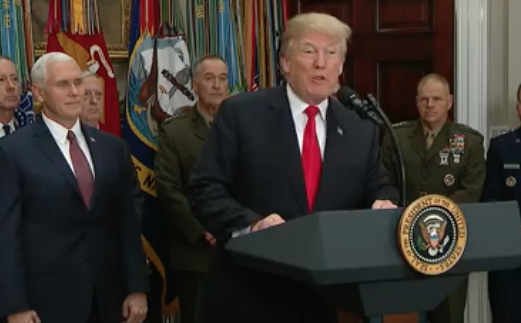 At his signing ceremony, Trump called on Congress to overturn its spending cap on the military. Many Republicans would be amenable, but Democrats may demand a parallel relaxation of budget limits on domestic spending, a non-starter for conservatives. Supporters of increased military spending, led by the Pentagon, point to how overworked the armed services are in today’s world environment. 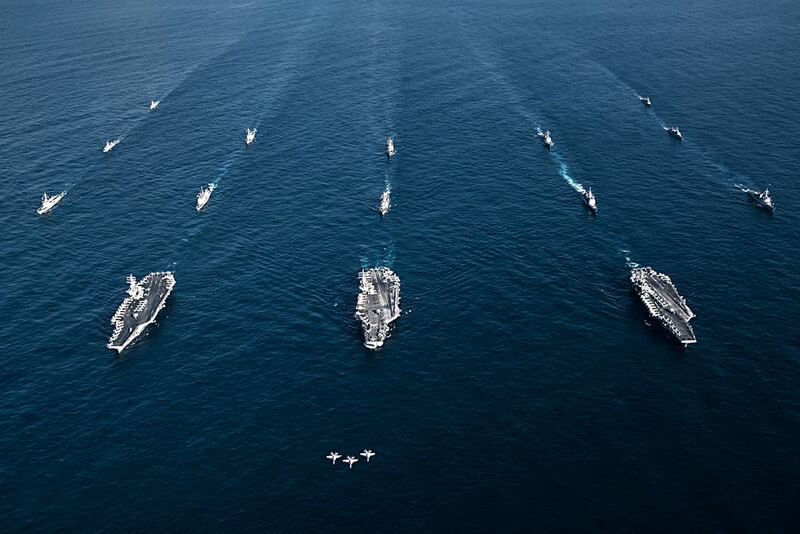 “We aren’t big enough to do everything we’re being tasked to do,” complained Admiral William Moran, vice chief of naval operations, in recent congressional testimony. Moran was right: it’s a lot harder to police the world with 300 ships then it was several decades ago with nearly 600 vessels and only one serious foe. Seen another way, however, budgetary realities might be sending us a message that it’s no longer feasible, or in the national interest, to maintain nearly a quarter million troops in more than 170 countries and territories abroad. Nor is it necessary for our defense to carry out vast military exercises from the Baltic States to the Sea of Japan in order to maintain dominance in Central Europe, the Pacific and Indian Oceans, the Persian Gulf, the Middle East, North Africa, and any number of other locations — all while conducting live military operations in Afghanistan, Iraq, Syria, Somalia, Yemen, Niger, and other war zones. Those who can’t see their way to setting limits on runaway military spending should reflect on the fact that the roughly $65 billion a year the Pentagon spends on active war-fighting, through the “Overseas Contingency Operations” fund, is roughly equal to Russia’s entire military budget. Only China spends more than that amount. And after those two countries, the next 15 biggest military spenders are all U.S. allies or reasonably friendly toward the United States. Taxpayers should also reflect on the fact that the Pentagon has never passed a full audit and has only a foggy idea of where all its money goes. “The United States Army’s finances are so jumbled it had to make trillions of dollars of improper accounting adjustments to create an illusion that its books are balanced,” Reuters reported last year. We may not know for sure where the money goes, but we know it amounts to a vast sum every year. Since 9/11, Americans have paid nearly $5 trillion for its foreign wars, according to Brown University’s Cost of War project — or about $25,000 per taxpayer. If Congress really wants to ease the tax burden on middle-class Americans, putting an end to our permanent state of war would be a good place to start.